We are not biology people. I'm pretty sure that everyone who knows us, knows that fact. Amber and I struggled to complete the requisite components of high school biology with only the minimum amount of labs in order to put it behind her forever. So, why in the world did we readily volunteer for a review of Marine Biology? 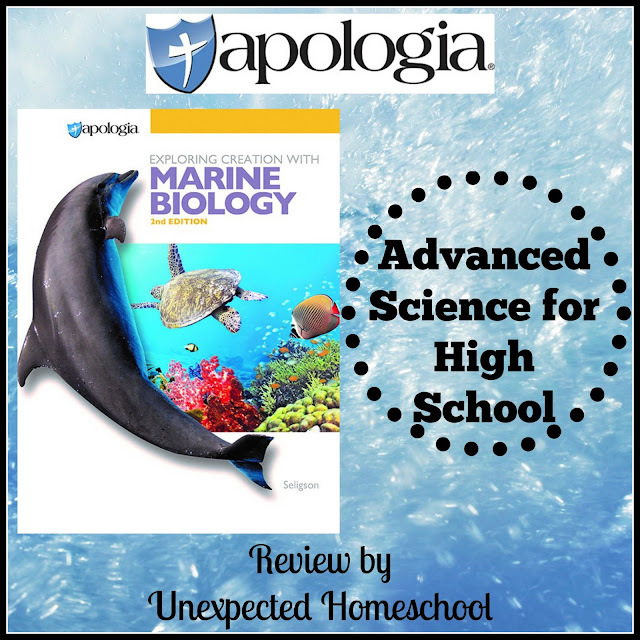 Through the Homeschool Review Crew, we were offered a chance to review Marine Biology 2nd Edition Advantage Set from Apologia Educational Ministries. Not only that, but we were also given the Audio CD read by Marissa Leinart. 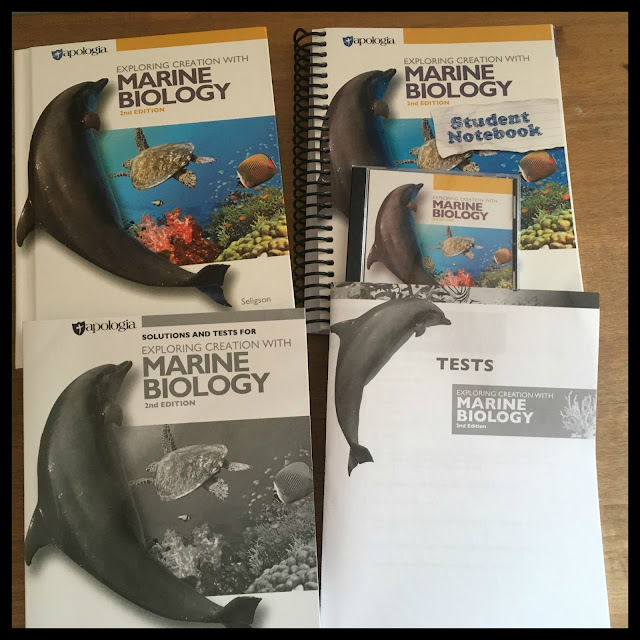 It's a fantastic and complete set with everything your homeschool high school student needs to study marine biology. I researched the set thinking it would not be for us, but I should be complete in my assessment. It didn't take much to win me over and then it was time to show my anti-biology child. Amber thought the topics in Marine Biology looked interesting - enough that she kept talking about the set. I should amend that statement. She thought Marine Biology looked interesting as long as she didn't have to do any labs. Amber could not stress enough her unwillingness to complete biological labs. I felt there was a good deal offered in this course that Amber should learn in order to be a responsible adult. Things we do not necessarily learn in our first biology course, yet affect all of us that live on this planet. And as I mentioned above, we also were given the MP3 Audio CD of the textbook, which is not part of the advantage set. This is set is not your basic high school biology course; actually it is expected that your student has already completed high school biology and is a necessary prerequisite to successfully complete Marine Biology. Apologia Marine Biology is geared towards upper level high school students, but does not require the type of math that chemistry or physics use, which makes it ideal for those students who are not strong in math yet. The course also qualifies for a full credit of high school lab science, assuming your student completes the labs described in the book. My daughter is in 10th grade and has already grudgingly completed high school biology, along with a host of other special topic science courses. I felt she was definitely prepared for this class, even if it might not be her in her preferred area of science. Let me tell you about each piece so you can get a clear picture of the quality of this curriculum. The textbook is divided into modules for each topic to be covered, much like other Apologia texts, with colored tabs on the right side of each page making it easy to find the individual modules. The course is written to the student in more of a conversational tone than many science texts available. Full color images and graphics break up the text nicely and provide alternative ways for the students to understand the information. Key terms are printed in blue throughout the text, with especially notable terms and their definition reprinted in bold blue between paragraphs. This is especially useful when working on the terms in the Student Notebook. Green text is used for special side bar paragraphs categorized as "dive in", "think about this", and "creation connection". Throughout each module are "On Your Own" questions, which can be easily found by their green background. These are the questions your student should complete to reinforce their understanding of the concepts in those sections of the module and are also reproduced in the Student Notebook, if your student is also using it. The answers to the "On Your Own" questions are provided in the textbook, allowing your student to check their own work. The modules all have an additional study guide at the end that helps prepare the student for the module test. Answers for the study guide are provided in the solutions manual. Experiments are scattered throughout each module, and denoted by a grid paper background. The experiment information provides everything your student needs to do a proper lab report, including the purpose, supplies, hypothesis (or question), step-by-step procedure with images and graphics, and finally hints to write a conclusion. 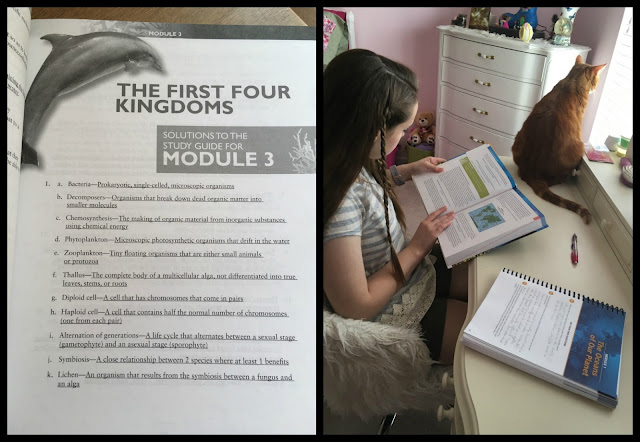 The textbook, of course, has a glossary of terms, and appendix with reference information, an appendix with Module Summaries where the student is expected to complete the blanks, and finally an appendix with a complete list of lab supplies. Textbook samples - Amber and her cats have enjoyed this text. 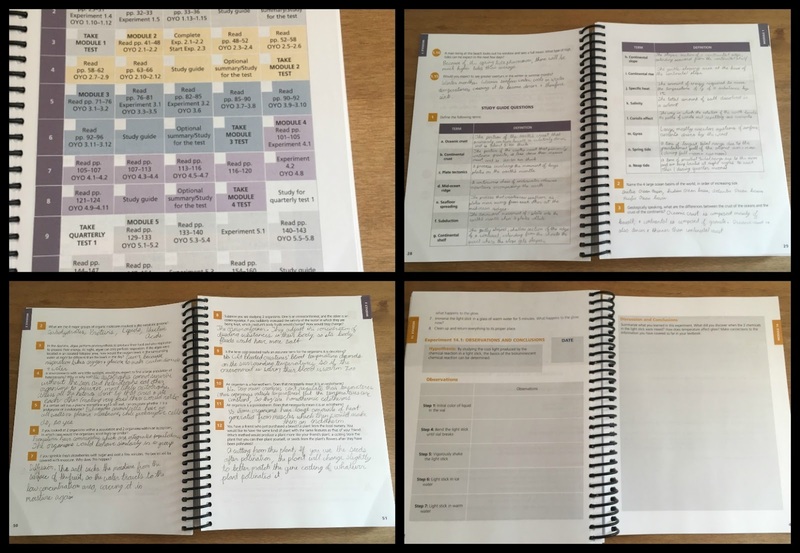 This notebook is not strictly required to complete the course, however it makes life for the student and teacher so much easier by having all of the questions, study guides, and experiments in one place. The Student Notebook also has a recommended daily schedule that will assist the student in completing the course in one school year. The schedule shows you exactly what pages to read, which questions to complete, and which experiments to try each day of the week. Every module starts in the Student Notebook with blank lined pages for the student to take notes from their reading. This is a fantastic idea for those students who are note-takers. It allows them to keep their valuable notes with the rest of their Marine Biology work. 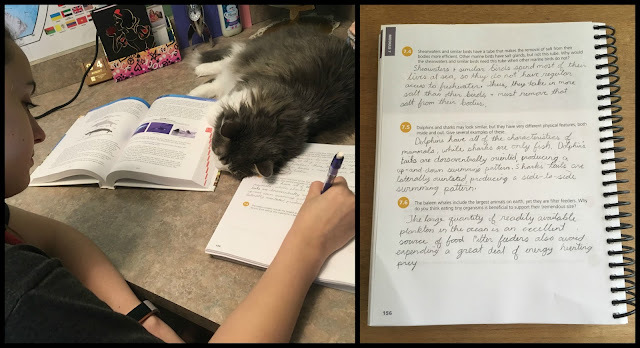 The Notebook continues with all of the "On Your Own" questions from the module, labeled by section so your student will know where they should find the answer and which questions match their assigned reading. The study guide has places for definitions of important terms from each module. While it may seem like a little thing, it helped my student solidify what the important points and terms of each module were. The study guide from the text book and the module summary from the appendix are also included in the Student Notebook. Instead of the the lab reports being inline with the rest of the module questions, the entire back section of the Student Notebook is dedicated to the experiments, organized by module. The complete information for the experiment is reprinted in the Student Notebook, along with graphics and pictures. Then the student is given ample space in a lab report format to write a hypothesis, make their own observations, and document their conclusion. Student Notebook samples - schedule, some of Amber's work, and an experiment report (which we aren't doing). Additionally, quarterly test solutions are listed inline where the schedule expects you to offer these tests. Unused copies of the module and quarterly tests are included prior to the answers. What I love most about this solutions manual is that the questions are listed along with the answers. It is so hard to go over questions with my daughter and help her with problems when all I can see are the answers. Without looking at her book, I don't know what the issue at hand might be when all I have is an answer that may or may not make sense to her. So, I appreciate Apologia providing the questions and answers in the Solutions Manual. Also included with the Advantage Set is a separate test packet that has each module and quarterly test ready for the student. The tests are not perforated in the booklet, which makes it hard to copy (as allowed) or give the student only individual tests. However, it does make it easy to keep their entire test record together. It really depends on what your testing preference is. This handy CD comes with the entire text read by Marissa Leinart in a pleasant voice without any discernible accent. The files are MP3, which means it will not work if you put it into a standard CD player unless it also can play MP3 files. Instead you need to use this CD in your computer or other device that reads MP3 files. The CD comes with its own MP3 player, in case you don't have software able to read MP3 files on your computer. We did try both iTunes and the MP3 player on the CD and actually preferred using the player on the CD. The provided player made it easier to navigate around the CD without copying everything to my computer. Each section of every module is a separate MP3 file, so you can easily find your place and listen to only the sections you want to work on that day. Even the side notes like the "Dive In" sections are read. These audio files are not a summary of the textbook, but a word for word reading. Your student can listen and follow along in the book so they are able to see the associated images with the text. The CD will be especially useful for auditory learners or students who are slower readers that struggle finishing their science text reading in reasonable times frames. Other students will also appreciate knowing the correct pronunciation for the science terms. Trying her best to not read ahead while listening to the CD on my computer. What Is So Special About the Apologia Marine Biology 2nd Edition? Thanks for asking. Let me tell you what made a family who struggles with all things biology want to use this set. Just perusing the topics of Apologia's Marine Biology will give you a fairly decent idea how it differs from the standard high school biology. Obviously we would expect topics like "The Oceans of Our Planet", but learning about plate tectonics in that module was a bit surprising. Of course, the text continues with Life in the Sea, the First Four Kingdoms, Marine Invertebrates, and Marine Vertebrates. All of those topics are interesting, but not necessarily what drew both Amber and me to the course. It was the Marine Ecology, learning about the Intertidal Zone, Estuary Communities, Coral Reefs, Continental Shelf Communities, Epipelagic Zone, and the Deep Ocean (with hydrothermal vents) that caught our attention. While this course focuses on the biology of marine life, there is marine information beyond learning about cells and basic biology. We get to learn about our fascinating oceans and how even our landlocked life is affected by the marine world. She's happy doing just the book work. How Did We Use Marine Biology? Since I dislike biology as much or more than Amber, I readily agreed that she could review this curriculum without doing the labs. She has, after all, exceeded her required lab science credits already. 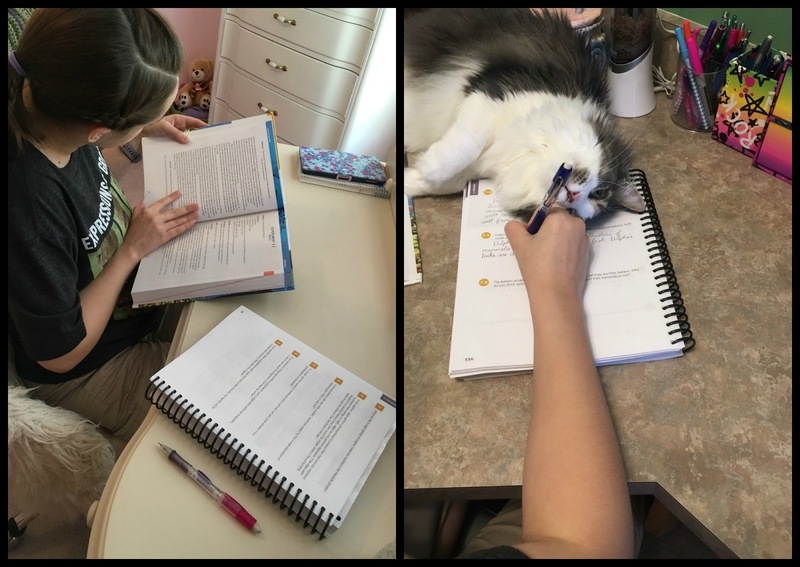 Instead Amber has been reading each module, completing the "On Your Own" and study guide questions in the Student Notebook, and some quizzes / tests. As agreed, she has been bypassing all lab work, even if it is not exactly a biological lab. And do you know what happened? Amber started enjoying a biology based course. Yes there have been a couple of modules where her only comment was "It was disgusting. I'm glad that module is over." But other modules where she answered "I really love this. Did you know ...." And usually, I did not know. We did try out the audio CD for one of the modules, but Amber wasn't a fan. She made a valiant effort to listen to the whole module. Although the reader speaks clearly and with interest, it is just much too slow for Amber who reads fairly quickly. Sometimes I caught Amber a couple of pages ahead of the MP3. Additionally, Amber has auditory processing problems, which compounds her dislike of audio books. Still, this is a great option for many other types of learners. Because we are skipping all of the experiments, Amber is already through 7 of the 16 modules. That alone should say something to her interest level in this course. I do realize she is not getting the full benefit of what this Marine Biology can offer by avoiding all of the experiments. Yet if you understood our deep disgust for biology experiments, you'd share in my joy that she is almost halfway through the text! Amber already had her science courses for this year set, and I'm even teaching her chosen classes at our homeschool co-op to make the experiments fun with a group (see we do actually complete some experiments). These classes are not biological in nature, as you can imagine. However, Amber is honestly intrigued by the Apologia Marine Biology course. 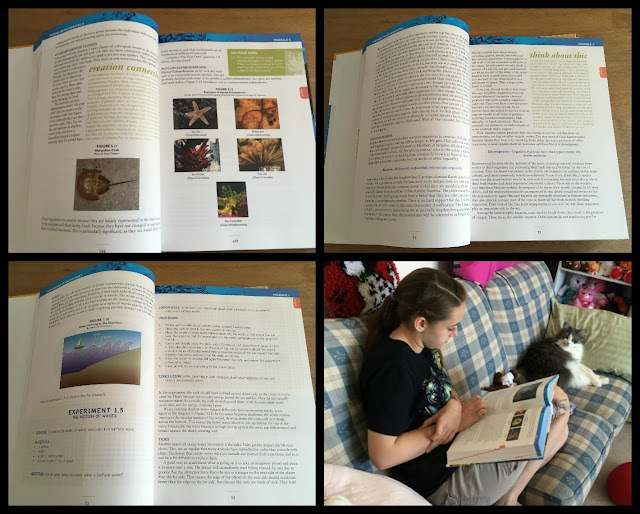 Coincidentally, another parent in our homeschool co-op is teaching a Marine Biology course using this new 2nd edition of Apologia's Marine Biology, still Amber still has no desire to take that class because of the labs. 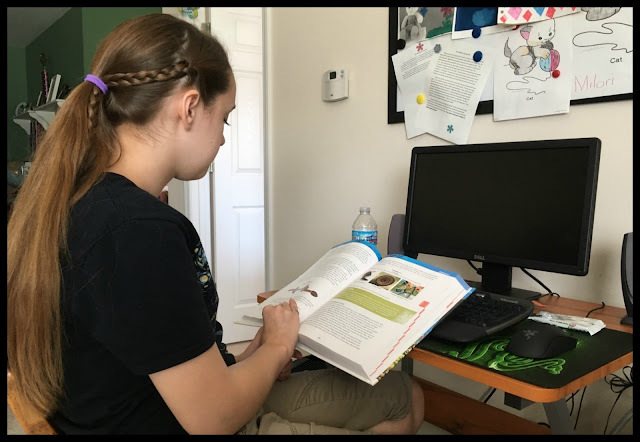 In the end, Amber decided to finish Marine Biology at home using the same method she has been during the review period: no labs, but complete the journal with the reading, and maybe even a few tests. So, the answer is yes, we will continue with the Marine Biology 2nd Edition and be ever so grateful for the opportunity to learn more about our world. Other members of the Homeschool Review Crew also reviewed the new second edition of the Apologia Marine Biology. Please follow the link in the graphic below to read their thoughts. Did you l9ok through the Labs to see what they require? Would be interesting to know what type of things they ask for. I did, but this review was so long already and I couldn't speak to how any of the labs worked out or if the supplies were easy to obtain. So I left it be and readers can view the lab list on Apologia's website for this course.